Distribution in Turkey: Absent From Aegean, Marmara region and Northern Black Sea. Distribution in the world: Allancastria deyrollei is distributed from western Iran to Turkey, Syria, northwestern Iraq, Lebanon, Jordan, Palestine and Israel. Living Area: A common inhabitant of the open pine forest and dry flower valleys in the meadows steppes. İt is found in altitudes of 750-1750 meters. Flight time: March- April in low-lying areas ; Late May June at higher altitudes. Food Plants of the caterpillar: Caterpillars, feed on the plants from the family Aristolochia spp-(Birthwort). Description-Notes: Typical locality, Middle East. Allancastria deyrollei, medium-sized species belongs to the family Papilionidae. A Pale yellow butterflies decorated with black and red spots and bars. Sexes are similar, but females are more heavily marked. Festoon butterflies, wings, black, yellow or pale yellow dot in a large number of on floors, scalloped wings and rear wings and are easily recognizable by the red spots. 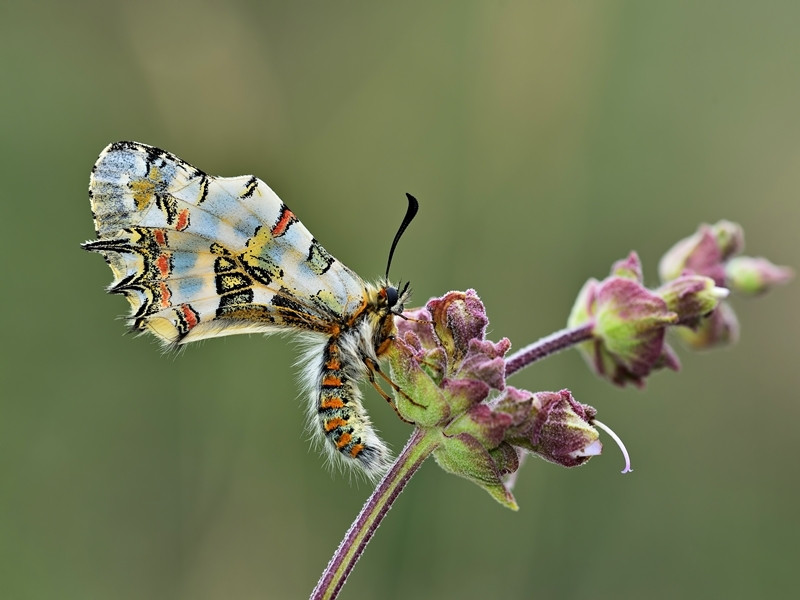 A Pale yellow festoon with strongly serrated hindwing and abdomen barred with orange on its sides. Prominent black bars on forewing don't extend across the width of cell. The legs in adult butterflies are brown in colour. Origin of the name: Zerynthia, Greek, place name. 1. Baytas Ahmet, 2007. A field guide to the butterflies of Turkey, NTV Yayinlari, Istanbul.18 pp. Great composition of insect and flower. Super colors and pov is also well chosen. The light green background completes it all. Stunning colors and details. Impressive specie....Never meet in in the wild. Nice to see a new photo from you. Fantastic butterfly in splendid colors and excellent sharpness. Great composition with a blurred background. This is the first time that I see this species. Neat composition with perfect DOF, sharpness and exposure.